The electro-kinetic potential of colloids is known as its zeta potential. This is the difference in charge repulsion/attraction between mobile particles in a dispersion fluid, and the stationary layers of ions which have attached to the surfaces of insoluble nanoparticles dispersed throughout the medium. Zeta potential measurement is performed by dispersing nanoparticles in a liquid medium of varying pH levels, and applying an electrical field throughout the colloid. Using dynamic light scattering (DLS) equipment, it is possible to observe the nanoparticle’s motion (velocity) and interaction with ions in the dispersive medium. Charged dispersion particles will form a series of layers on the surface of the nanoparticle, collectively known as the electrical double layer, which comprises an initial skin of charged ions and a secondary diffuse outer layer. As the nanoparticle moves through the dispersion, the particles attached in these layers exhibit different electrostatic properties to those particles forming the bulk of the dispersion fluid. This electro-kinetic activity is significant in the characterization of product stability, providing insights into the formulations of emulsions and aiding product optimization through rapid and accurate assessments of additive success. Zeta potential measurement is a significant particle analysis method in particle aggregation studies and the establishment and optimization of emulsion short and long-term physical stability. Zeta potential measurement has shown that dispersions with a charge close to zero – whether exhibiting a positive or negative charge – tend to yield shorter shelf-lives, with an inclination towards coagulation or flocculation of emulsions. Conversely, emulsions with a surface activity greater than ~ +/- 30mV are inclined towards improved system stability and low aggregation. Zeta potential measurement is therefore an important consideration for the accurate establishment and forecasting of product shelf lives, particularly as a screening method for the control of repeated batch consistency. Particle analysis such as zeta potential measurement is increasingly important in the food and beverage sector, where mass-production and packaging of food and beverages for worldwide sales must meet stringent mandatory compliance criteria and performance standards. End products must consistently deliver on taste and texture, they must be reproduceable on large scales, and they must advertise accurate shelf lives for safe human consumption. Zeta potential measurement can not only provide accurate data towards shelf-life forecasting, it can aid in research of potential additives to improve zeta potential, thereby increasing product stability. Meritics are particle size and zeta potential measurement experts, providing services and instruments to academic and commercial sectors alike, where precise and consistent measurements are fundamental to achieving repeatable results for studies or for the manufacture of consumer products. Meritics provide zeta potential measurement systems suitable for all levels of research, development, and manufacturing, allowing for rapid analysis of particle properties and characteristics. 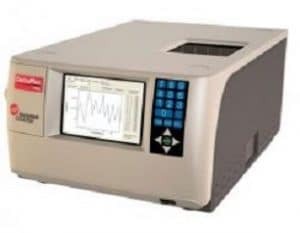 The DelsaMax Pro is a zeta potential and particle size analyzer capable of simultaneous assessment of particle size and zeta potential in as little as one second, with instant results cross-checking. This accurate rapidity is crucial to the optimization of high-quality, fast-moving consumer goods. It is very important in measuring zeta potential that the time and level of current passing into the sample are minimized to avoid any possible damage to the sample, particularly biological materials. In the DelsaMax Pro from Meritics, both particle size and zeta potential are measured simultaneously, and in just a couple of seconds minimizing any potential sample damage and also allowing measurements of aggregation to be made over short periods of time. To minimize the appearance of gas bubbles which can interfere with the zeta potential measurement, the Assist option pressures the sample to optimize data. If you would like any more information about our zeta potential measurement instruments, or any of our other products, please do not hesitate to get in touch.